Tokyo is a huge, sprawling megapolis on the island nation of Japan. With its great urbanization over the past decades, observers could expect to see some warming at least from the urban heat island effect as well as from the “huge” warming the planet has allegedly seen globally over the past 30 years. But in Tokyo this has not been the case, surprisingly. Looking at the chart, we can see that 6 months show a steady or even a cooling trend. 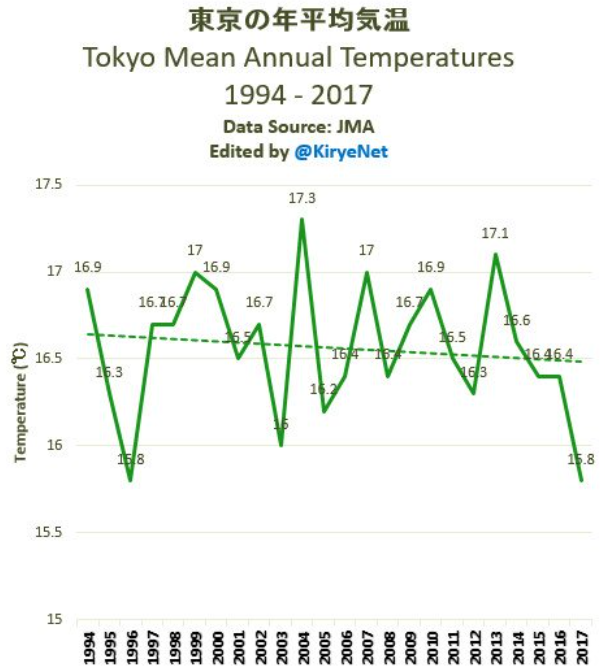 Overall over the past 30 years, Tokyo has warmed modestly, but that warming trend, however, is mostly due to the colder years in the late 1980s and early 1990s. Even more interesting is the fact that Japan’s capital and largest city has even seen an accelerating cooling over the recent years. The year 2017 was the coldest in over 20 years. This contradicts claims of runaway warming that we often hear from climate warming alarmists. Also the globe has been cooling since the peak that was brought on by the most recent powerful El Nino. This [a certain city not warming] contradicts claims of runaway warming that we often hear from climate warming alarmists. I’d say this contradicts the pseudoskeptic claim that all the warming comes from cities with their urban heat island effect. Don’t you agree? So … if big cities aren’t warming like the rest of the country, what does that say about the UHI effect and its role in those ever increasing temperature charts? My Japanese is not real great but these charts refer to the World, do they not? I don’t know what ‘temperatures’ are referred to in this but get us something to confirm, will you please? Well that is a helpful translation thank you very much. 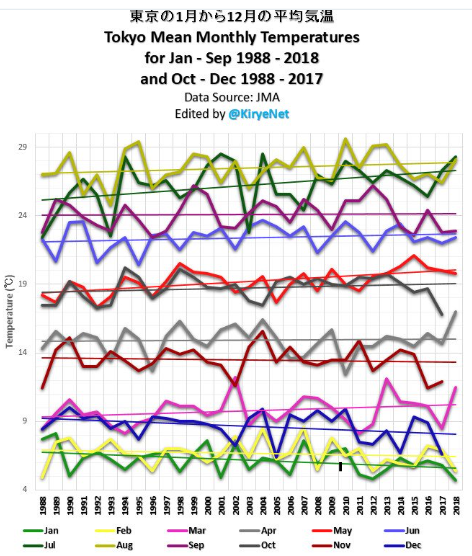 It says this is deviation from reference (assumed average) values over the years 1981-2010. Would you mind explaining how, on this graph, all of the recorded deviations over these reference years are NEGATIVE? How can this be? Wouldn’t these temperatures fluctuate around the zero? The average of those numbers is 0. Those are not “temperatures,” but “temperature anomalies,” which, when seen in perspective, are just background noise. I.e., they are nothing in comparison to the huge variations we see yearly, monthly, and even daily. But it’s so much harder to scare people if you tell them the truth. Fix THIS GRAPH in your mind, remember what it means, and you will never again be fooled by misused irrelevant data. Take the table I linked and do work the yourself. I think everyone is aware of us talking about anomalies. But referring to Lindzen on anything makes this a very special reply though. Mentioning that anomalies are small compared to even daily temperature changes is just the icing on the cake. Next you will surely claim that the average change of your bank account anomaly pales when compared to the withdrawels and depositions and thus your monetary worth changing doesn’t really mean anything. If I have $100,000 in the ban, I wouldn’t be spending $1,000,000 to stop it going up and down by $10 a day. Nor would I be going into a DEEP PANIC about what MIGHT happen in 20 years time. But that is climate séance for you. ! 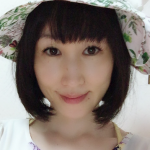 Whatever you have linked to is not Japanese based data. And anyway, there is zero-evidence that any real warming has anything to do with human activity. 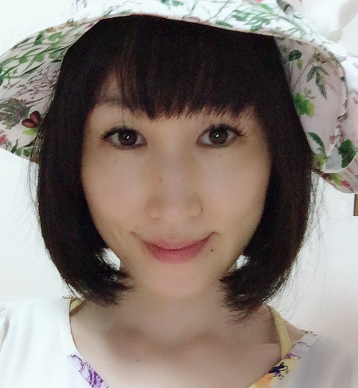 You have shown that CONCLUSIVELY, thanks. Be very glad of the slight warming out of the LIA, the coldest period in the last 10,000 or so years. and so on … use the drop down to see others months from that table. Just shows that most of the Japanese sites are well maintained and not too subject to the massive. 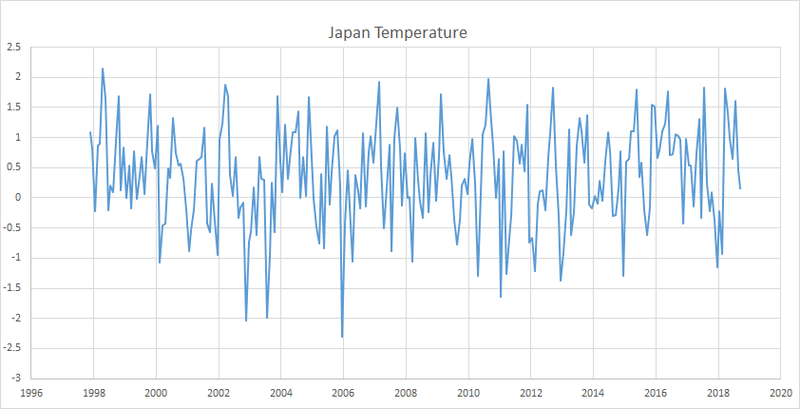 Or that Japan has ACTUALLY BEEN COOLING. You really should AT LEAST TRY to actually THINK about what the graph is showing before you post..
.. Save yourself the ignominy of yet another hilarious slap-stick faceplant. Brian, my Japanese is close to zero. I’ll ask Kirye. This September was 16th warmest in the last 40 years. A reasonable question would be, without a UHI effect, how much cooler yet might it be? I repeat it for you in plain words: those links are from the same website that you link to. How can this clear fact slip your attention? Or is this another case of “always claim the exact opposite of what this other dude says”? Of course, it’s all fabricated data if you don’t agree with it *sigh* (only then don’t link to it yourself, that makes you look a bit confused). Sorry you are INCAPABLE of taking the data and showing that I am CORRECT. We know your abilities are truly limited. Are you saying the NOAA/NCDC is NOT a total fabrication. Are you saying you don’t recognise it when you see it. You suffer DENIAL to the very core of your emptymess. You are truly a mad man. Not going to reply to the other nonsense you posted in various replied in the comments below this article. But really, its nothing more than the cackling of a headless chook. Everyone KNOWS that the stuff from NCDC/NOAA is not actually REAL, seb.. you should be more sceptical about the garbage put forward by your fellow AGW collaborators. .. . what would you expect to happen.. DOH !!! So human structures can significantly alter the climate, but emissions can’t because they are so small an insignificant. I wonder how pseudoskeptics like you make this work in their beliefsystem. LEARN the difference, little seb-troll. 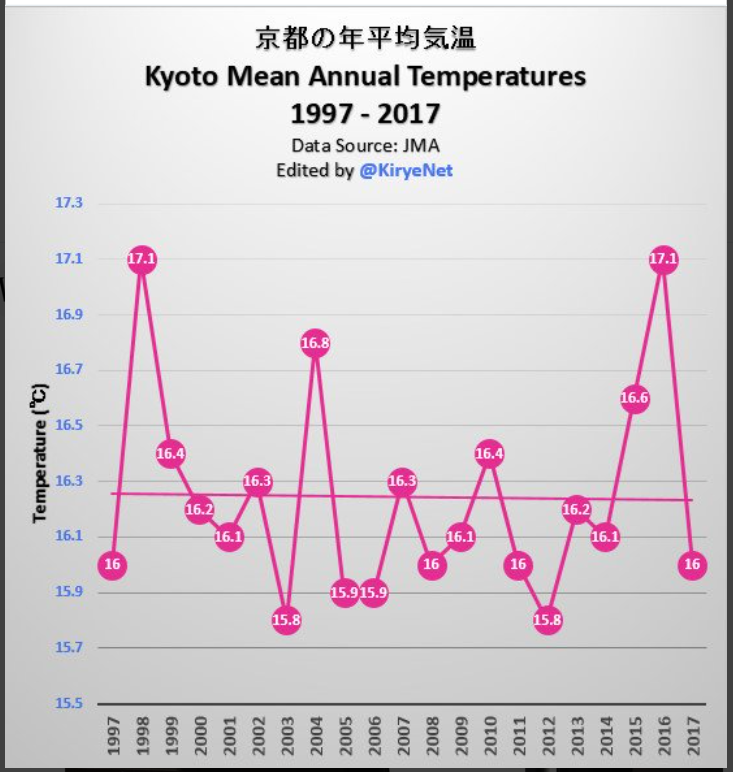 spike55 and SebastianH: you say you use the same temperature data of Japan but you get totally different graphs. How come? Here’s the data, I just graph it. You have to wonder what loonie thinks it is actually in any way linear, and the red line means anything?? It actually shows strong cooling for NEARLY ALL of the time, with two very distinct jumps. And let’s remember, there was the coldest period in 10,000 years, ending some 50-70 years before the graph starts. One would certainly HOPE for some warming to occur from that ANOMALOUSLY cold period.